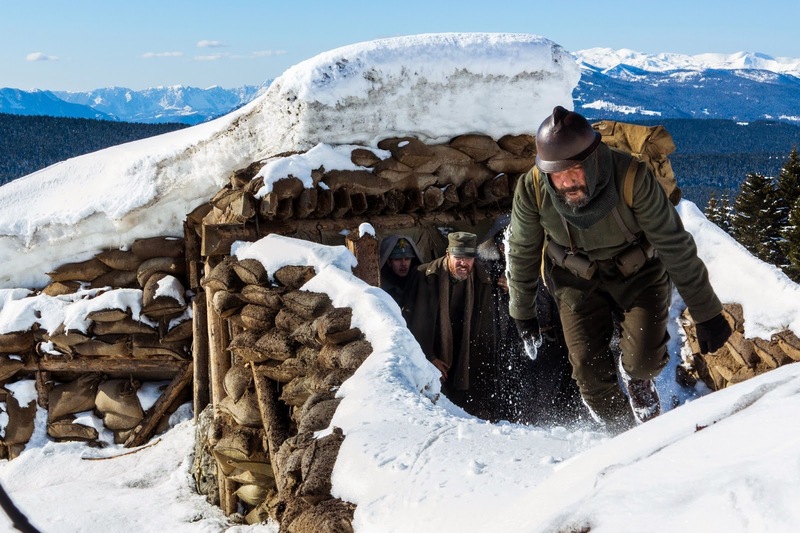 The latest film by Ermanno Olmi, a dean among the Italian directors, was dedicated to the memory of his father and to the tales of the First World War experience he made when Olmi was a child. These tales resemble a kind of enlarging memory and legacy inside the director’s mind, who is not new to this kind of historical operations. torneranno i prati (“The Meadows Will Return”) is a short film all set in an extremely advanced outpost of the Italian lines. The place is the enchanting mountain plateau of Asiago (the place where Olmi lives now) and the time frame is tightened to the last moments of war, when there was no doubt around among soldiers about the real meaning of the carnage that was supposed to end soon (only to stop for a while). "I thought there was a task to fulfil: that of telling the great betrayal done to those people who have died and never knew why. And with the dead and children, as we know, we cannot cheat", Olmi said after the première and this declaration is enough to shape the real intent of this work. The story alternates hectic bombardments and quiet, silent and contemplative scenes but what the director prefers is for sure the reconstruction of inner views and subjective perceptions of his group of soldiers. At a cinematographic level the continuous presence of the moonlight is remarkable, in contrast with the rockets making their contrail in the sky announcing the bombardment and the proximity of death. A great attention is paid on the parallel life of letters, correspondence, family photos and other personal belongings but also a great effort was done to rebuild the linguistic differences among comrades. An episode about the selection for a high dangerous patrolling action includes a suicide and in the short time of this film there is also space to depict the strange appearance of a new plague, namely the Spanish flu, also known as 1918 flu, that turned eventually into an additional tragedy and into a silent killer. Literary fathers of this latest work by Ermanno Olmi are probably the writer Mario Rigoni Stern and Emilio Lussu, and not only for geographical reasons: if the first spent his whole life in the Asiago plateau and dedicated to the post-war period a book (Le stagioni di Giacomo - “Giacomo’s Seasons”), the second one is the author of probably the most important account that Italian literature brought to life after the war, Un anno sull'Altipiano ("A Year on the Plateau"). Finally it makes sense to remember that last year torneranno i prati was the only Italian film selected for the Gala section of the Berlinale, Berlin's International Film Festival. And a quick note and plaudit is almost required for the music, too: the trumpet and flugelhorn player Paolo Fresu is far from simply putting a kind of trademark to the soundtrack (like many other musicians do when asked to create the soundscape of a film) and surprisingly coexists with Olmi’s spirit. You cannot ask more to a music for such a film and to music for films in general.